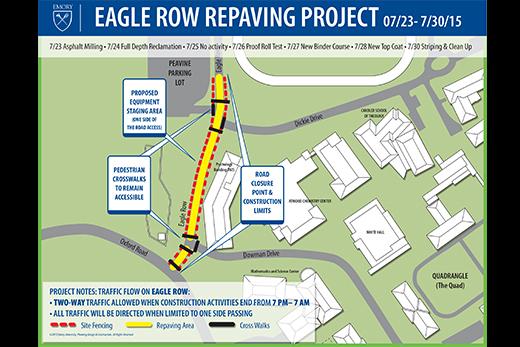 Campus Services is planning to repave and repair the west side of Eagle Row near Oxford Road, part of Dowman Drive and Dickey Drive beginning the evening of Thursday, July 23. 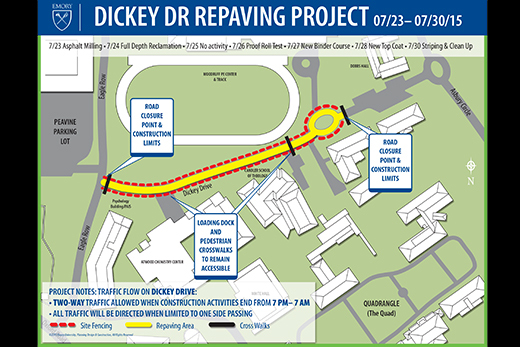 The project is scheduled to conclude on Friday, July 31, weather permitting. All three roads will have consistent construction activities during working hours, although the most disruptive activities will occur overnight and on the weekends. The project will correct failing areas of pavement by rebuilding the sub-base and installing new asphalt paving. 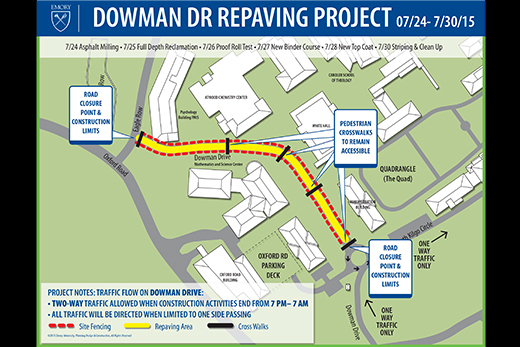 The repair schedule allows for traffic to continue on each road in both directions, but traffic flow will be limited to one lane at times based on the sequencing of construction activities. There will be no change to current Emory Shuttle service or entrance points into campus, however there will be intermittent delays, so please plan accordingly. Campus Services recommends using the Clifton entrance to access the Peavine parking decks. Bike lanes will be closed, so bicycle riders will need to find an alternate route. As a precaution traffic control will be employed in various forms with the use of electronic messaging boards, a pilot golf cart to lead one-way traffic, construction signage and flagging personnel at all main intersections. These elements will help drivers and pedestrians maintain their regular plans and path of travel or allow them to seek alternate routes. Each road receiving paving repairs will be lined with temporary construction safety fencing to protect pedestrians from active construction areas while providing clear direction of safe places to cross the street. Campus Services project manager Randy M. Simon will serve as the point of contact for these activities and is available to respond to any questions, concerns or comments at 404-964-0450 or randy.simon@emory.edu. Updates will also be posted at construction.emory.edu.